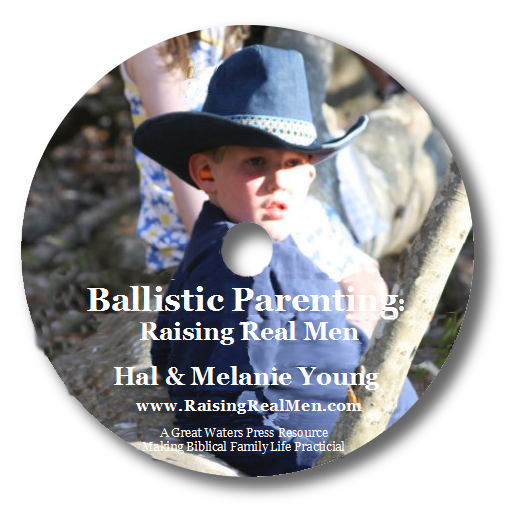 Raising Real Men » » Days Are Short and Shadows Are Long! Days Are Short and Shadows Are Long! At Classical Astronomy, we simply try to point out the easily-observable aspects of sky observing that are usually overlooked in our modern generation. One of those aspects is the varying length of shadows over the span of the year. As the Sun moves through the zodiac constellations over the annual cycle of the seasons, the Sun moves to its highest point overhead in the sky on the summer solstice. On this day, the noon shadows are the shortest. Because of the orientation of the sky, the height of the Sun corresponds to the length of daylight, so the Sun is highest in the sky on the longest day of the year. Here’s a picture of our son Dave, taken a couple years ago and first reported in the Classical Astronomy blog. Dave is standing in our backyard compass on June 17, near the summer solstice, a little while before “high noon,” when the Sun crosses the meridian (not the same as “clock noon.”) Note how short his noon solstice shadow is, as seen from the latitude of Cleveland, Ohio (about 41 degrees north). After the summer solstice, the Sun begins to move south through the constellations. The Sun’s noon height decreases over the summer, and the days grow correspondingly shorter. Here’s a pic showing Dave’s shadow around noon on the autumnal equinox, September 23, when the daylight is the same length as the period of nighttime. Note how much longer Dave’s shadow is, nearly as long as he is tall. 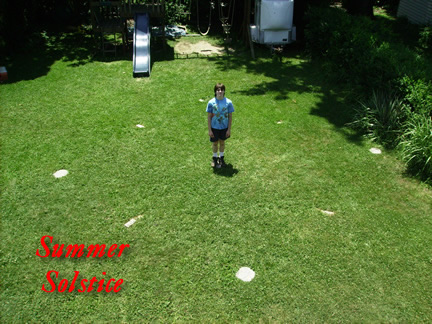 See how long the shadows are of the trees and other objects in the backyard, and how our kid’s playset is in the shade, though it was in daylight at noon on the solstice. Also observe how different the noon sunlight looks when the Sun is at a slanting angle and not directly overhead. Here’s a pic showing Dave’s noon shadow near the winter solstice. Note how long his shadow is, especially compared to the previous summer and autumn shots. On the winter solstice, the Sun is very low in the noon sky, and noon shadows around the shortest day of the year are nearly twice as long as the height of the persons or objects casting them, twice as long as on the equinox only three months before. 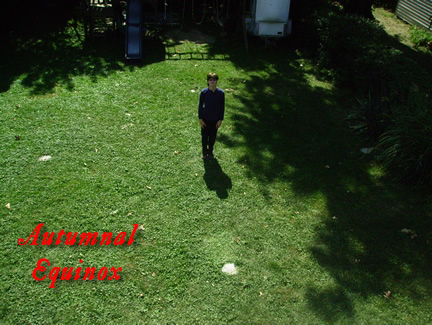 The shadows in our backyard were so long that Dave needed to stand next to the actual standing stone to find the Sun’s rays, since the shadow of the pine tree in our backyard covered the compass. The standing stone and the “North” marker stone are indicated with red circles to make them more clear, since we had a big snow storm the day before. However, our neighbor’s oak tree had lost its leaves, and didn’t cast much of a shadow now as it did in the summer and fall. Throughout history, it was common for farmers and sailors to use such obvious signs in the sky to measure the passage of time, as the LORD provided in making the Sun, Moon and stars (Genesis 1:14). 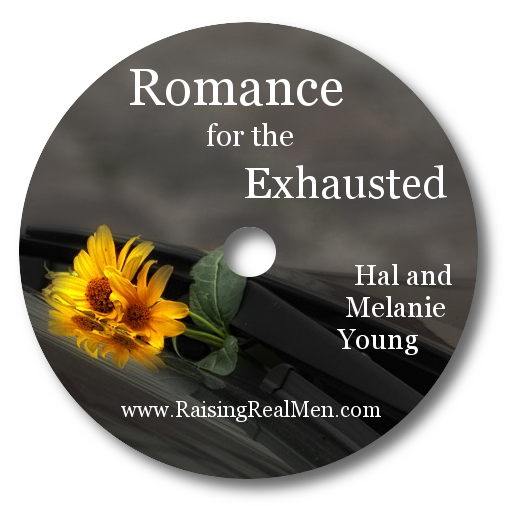 However, in our generation, we have become reliant on technology such as clocks and wall calendars, and we no longer consult such simple signs, not even to simply appreciate the LORD’s handiwork. 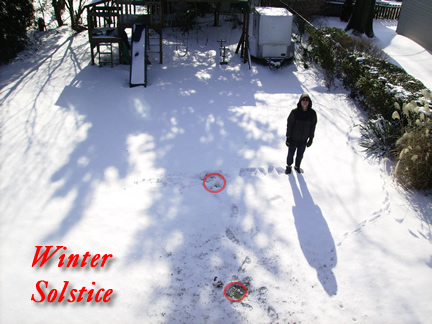 The time of the winter solstice is a good time of year for homeschoolers to begin noticing the noon shadows, since you can watch them get shorter between now and next June. The seasonal changes in the shadows are among the many things your homescholar can learn from Signs & Seasons, our Christian homeschool astronomy curriculum. We hope that you all will learn to take some time from your busy lives to observe these common, everyday wonders. 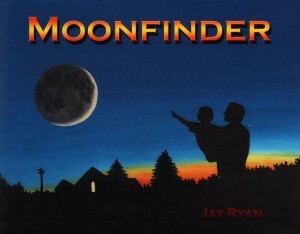 Jay, the author of this article is also the author and illustrator of one of the most beautiful picture books we own. Children will love learning about the scientific basis for the phases of the moon in Moonfinder – and you’ll build happy memories reading aloud to them! 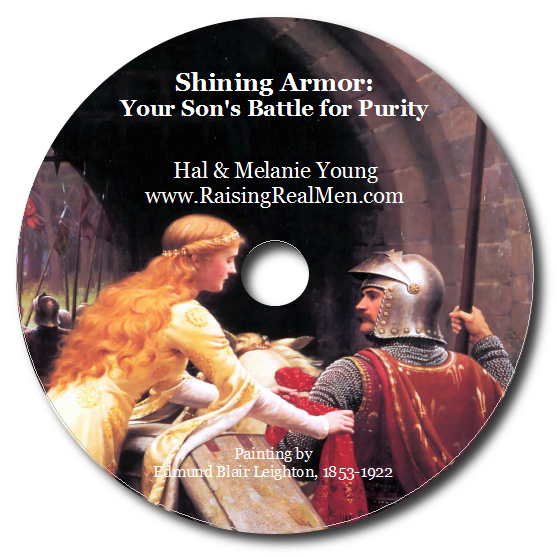 Get it in our shop now on sale.